Did you know that suicide is the #2 cause of death for people between 15-34 years old? Did you also know that the best way to prevent suicide is through early detection, diagnosis, and treatment of depression and other mood disorders? Why then, are people so afraid to talk about it? This May, we have an opportunity to come together to learn from a Biblical perspective about this incredibly important issue. 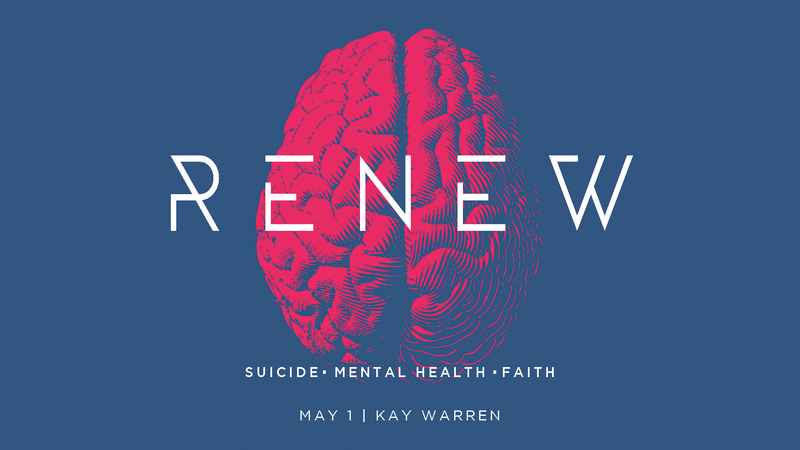 Join us for Renew: Suicide, Mental Health, and Faith, an eye-opening, hope-filled event with Kay Warren, co-founder of Saddleback Church and with the American Foundation for Suicide Prevention (AFSP). If you or anyone you love has struggled with thoughts of suicide, depression, or mood disorders, you will not want want to miss this important event. It just might save a life you love. We ask that you register so that we can ensure we provide adequate seating.